The Bassett 1191-02 Aria Aria Accent Chair is available in Hickory Park's, North Carolina Furniture Galleries. Hickory Park may be restricted from showing prices, however please select the Click For Quote button and Hickory Park Sales and Design Staff will reply or please call (828) 322-4440 for more information. width from furthest point left to furthest point right of the piece, as viewed from the front Height Over All: 36"
distance from floor to highest point of the piece Seating Width: 21"
distance from right inner arm to left inner arm of the piece, this is amount of space available for seating Seating Height: 19"
distance from the front of the seat cushion to the back at the point that it meets with the back cushion - may vary slightly based on fabric and cushion fill Arm Height: 24"
Seat Cushion Style: Boxed Attached Back Cushion Style: Boxed Semi-Attached Diagonal Dimension, Delivery Clearance: 29"
Wood frame accent chair that features brass or brushed stainless finished ferrules. Available in fabric or leather. 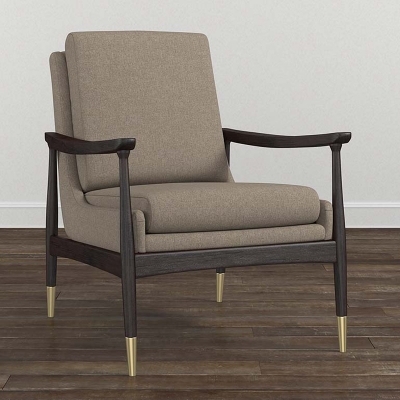 Click here to receive price quote for Aria Accent Chair 1191-02 item.